Charlie Brown was found near a lake with matted fur, thin and full of fleas. Someone took him to a vet and he then came to us. 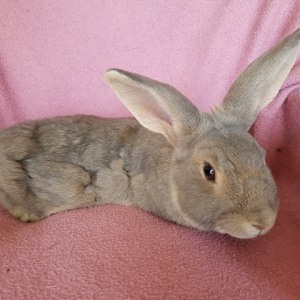 He has been treated for fleas and worms plus had his coat shaved due to the matted fur hence he looks very tatty still but his coat is growing back and is a lovely soft grey and brown colour. He is a very pretty boy. He has also been desexed and vaccinated. Charlie Brown is a cute little boy who appears to be fairly young. 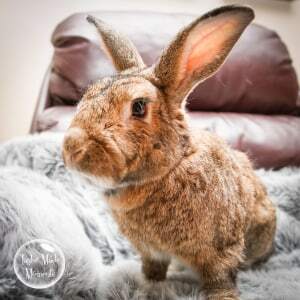 He hasn't been put with another rabbit yet so would suit a home either on his own or could try and introduce him to a female bunny for company. Charlie Brown loves his greens and carrot. He is still learning to use a kitty litter tray for his toilet training but is improving. Charlie Brown would suit a home with a single person, couple or older children as can be quite squirmy when picked up so will need someone who will be patient with him as he will get much better in time with more handling. He is located in Bullsbrook. 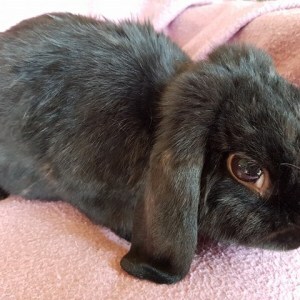 Kenny is a cute little pure black Dwarf Lop bunny. He also is quite a character in that he sometimes does his grumpy sound when giving him his food or giving him a pat. His carer finds him quite amusing which makes him stand out a little from the other bunnies. Kenny doesn't bite just makes grumpy sounds now and again. When he first came into our care he wasn't kitty litter trained but he is a smart boy and in no time he learnt to use a litter tray so is now a much cleaner boy. Kenny has a slight cloudiness to one of his eyes. The vet thinks he may have had a trauma at some point in his life. Is possible he can't see quite as well out of that eye but not 100% sure. 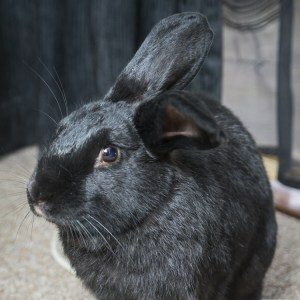 He could be adopted as an only bunny and best to a home with older children or no children. Kenny is located in Bullsbrook. Bonnie is a lovely mottled grey girl who needs a loving understanding forever home. She is looking for an indoor home where she can have an area of the house set up as her own with her toys, food and litter trays as well as some free range time. Bonnie is a sweetie who is a little reserved but is happy to be cuddled in a calm environment. She loves her food especially her fresh greens. 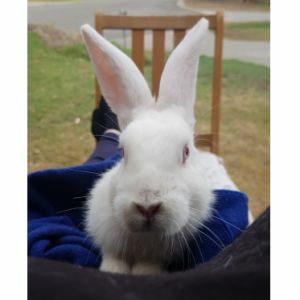 Bonnie would love to be adopted with her friend Sasha (White Cashmere x bunny) however she would also enjoy another rabbits company if you have one already that might like to meet her. 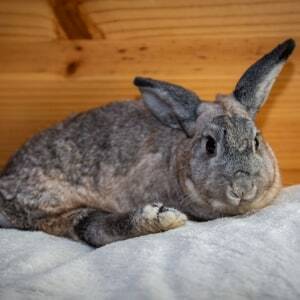 Bonnie is an extra special girl as she has a splay leg - this does not impact her quality of life, however there are a few small considerations that we can discuss with potential owners in regards to setting up her enclosure and basic grooming. She is looking for someone who will give her the love and cuddles she deserves. Bonnie lives with her friend Sasha and has lived with a small dog in a family home. For more information, please text her foster carer on 0414 268 948. She is located in Bullsbrook. Malakai (brown and white ) and Poppy (white with brown markings ) are looking for their forever home together. Two very social bunnies who enjoy each other company. Currently living with two bunny friendly dogs, they would make great family members. Pete is a confident bunny who was found and came in with his friend Hai Hai a domestic rabbit. They get on really well so they need to be re-homed together as are bonded. 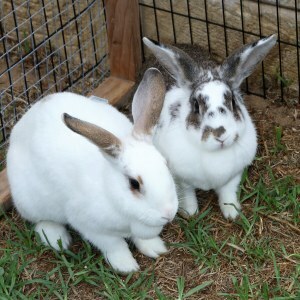 Having a friend is good company for bunnies as many people often look for another rabbit for their single rabbits as feel they need the company. Pete is curious and adventurous. They are best suited to a home with a single person, couple or family with older children. Miss Booful is a bundle of fun. She is a young rabbit who is very inquisitive and loves to explore the house. Miss Booful loves a cuddle and will happily sit on your lap and enjoy pats. Don't stop, she will tell you off! She does not have any rabbit friends at the moment but could possibly be introduced to a friend. Miss Booful would suit a home where she can have an area of the house set-up as her own with all her toys, food and litter trays with free-range access time to the house and supervised outdoor time when the weather is nice! Miss Booful is ok with cats and small, calm dogs. She is also ok with children but supervision is always best to ensure everyone gets along! Merlin is a mischievous little guy who thinks he rules the house! He is bonded with his wifey Luna and he loves her to bits! Merlin enjoys his freedom and he would love a free-range home with an area of the house set-up just for him! He would also really like supervised outside time when the weather permits. Due to Merlin's mischievous behaviour you will need to keep a close eye on him to make sure he doesn't get in to too much trouble but with his big personality you will be guaranteed hours of fun! Merlin is ok with cats and small, calm dogs. He is also ok with younger children but supervision is also best to ensure everyone gets along! Yuki is a beautiful white bunny with one straight ear and one floppy. She is lively and curious. 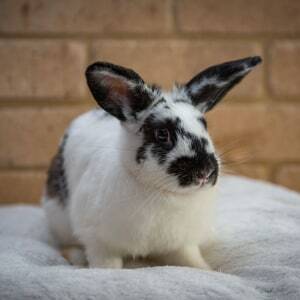 She is very good with other rabbits and bonds easily. She is shy but enjoys pats and would do well in a quiet household and with a companion. Benji is a domestic rabbit who is very independent. He enjoys exploring and discovering new areas, running, jumping, and eating all the hay he can find. 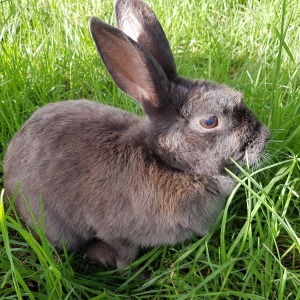 Benji would enjoy the company of a older teenager or adult, as he is quite skittish when it comes to cuddles, and would much more suit to be a companion to an experienced rabbit owner. Boisterous in his own right, Benji will let you know exactly what he wants and what he's feeling! 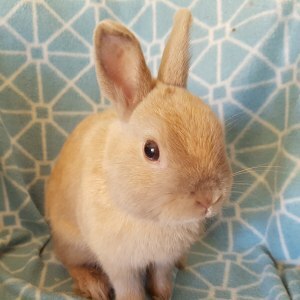 He would also be best as the only bunny in the family, and does not have much fear of other animals.